This fascinating poster fully explains the background and rich symbolism in the painting, Mary, Undoer of Knots. 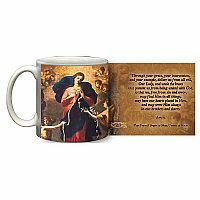 Pope Francis has been one of the greatest promoters of this particular devotion to Mary. This print of the once obscure painting by Catholic master painter of the 1700s, Johann Schmidtner, was inspired by a real German family's story of marital disunity, struggle, intercession, and powerful reconciliation. Almost 300 years later, the image deeply moved an Argentinean priest named Jorge Mario Bergoglio, who later became Pope Francis. 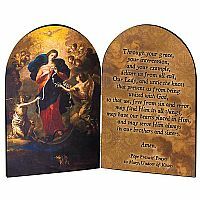 As a Jesuit priest in Argentina, he had reproductions of this painting hung in churches in order to spread the devotion. 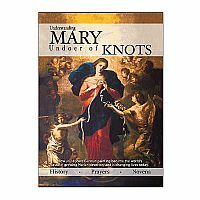 The invocation of Mary, Undoer of Knots has become widespread in the resolution of marital and family conflicts, as well as other difficulties. 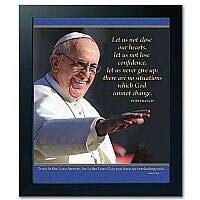 Printed on coated paper stock; 12" x 16"